Paint, draw and sculpt lively and colourful electronic musicians Swoomptheeng and Nimzo-Indian as they play live at Juneau Project's "I am the Live Warrior" - part of Coventry Biennial. Friday September 15th. 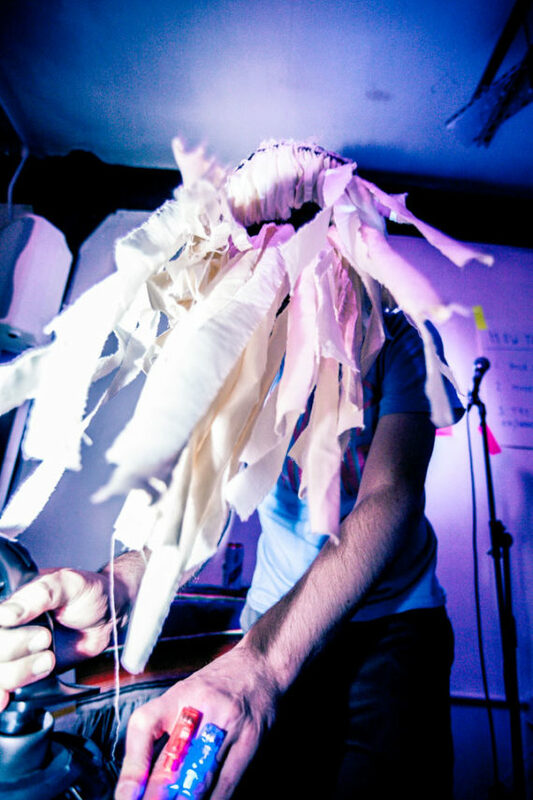 Paint, draw and sculpt lively and colourful electronic musicians s Swoomptheeng and Nimzo-Indian as they play live at Juneau Project‘s “I am the Live Warrior” – part of Coventry Biennial. Friday September 15th. I am an Artist, Musician, Educator, Performer and Creative Technologist based in the West Midlands. I frequently work with artists supplying coding, technological and audio-visual skills and run regular workshops for youngsters and students. My own projects tend to be cheeky and noisy, usually deliberately awkward, and occasionally provocative. They frequently revolve around music, and utilise technical skills such as creative coding and gadgets. I am currently an Artist Fellow at Birmingham Open Media. See more of what I get up to at www.maggothouse.co.uk and www.psiconlab.co.uk.